At present, in Ireland, it is illegal to use a metal detector without a license and these licenses are very difficult to obtain + very restrictive in terms of where one can use a metal detector. At face value, it is a common sense law designed to protect Ireland’s rich archaeological heritage from vandals, looters and thieves. Allegedly, this new law is driving detectorists underground, with many secretly selling their finds in Northern Ireland and England. A thriving black market exists for these artifacts – coins, tokens, buttons, pottery, bronze weapons and tools, gold jewellery, etc. Irish auction houses have a good reputation in terms of refusing to sell goods on behalf of people they suspect of looting or theft but auction houses in London have a long history of selling archaeological treasures smuggled out of foreign countries for the London and international antiquities markets. 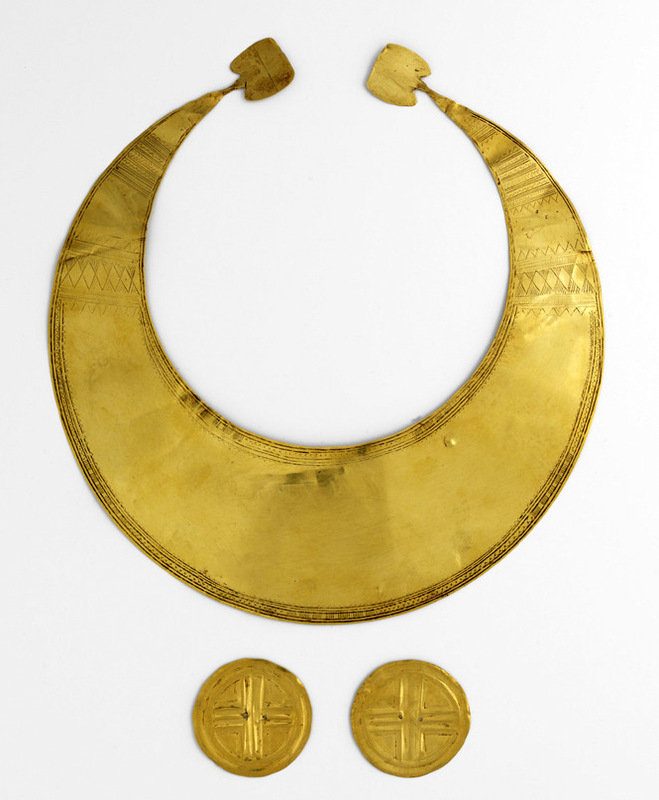 Gold Lunula (2010:246) and Gold Discs (2010:247, 2010:248), Coggalbeg, Co. Roscommon. In 1947, for reasons still uncertain, Hubert Lannon handed these golden objects over to Mr Patrick Sheenan, a pharmacist in the town of Strokestown, Co. Roscommon. It appears that neither man fully appreciated the value of the artefacts and the National Museum of Ireland was not notified of their existence. Instead, Mr. Sheenan placed the artefacts in his family safe where they were to remain hidden for the next 50 years, only occasionally being brought out and shown to curious visitors. Early critics of PAS opined that it would “open up the floodgates to organised gangs” of thieves, looters and vandals of archaeological sites. The actual outcome is very different. They also seem to be very generous about sharing their knowledge – something some academics are not good at ! More than a million archaeological objects recovered by members of the public from across England and Wales have been recorded on the Portable Antiquities Scheme (PAS) database since 1997. Many of the amateur archaeologists of the 19th century are quite rightly viewed by modern archaeologists are bunglers at best and looters at worst. Many of their finds were undocumented, dug without any due regard to context and often ended up as trophies in wealthy landowners’ cabinets. Worse still, many hoards were broken up before any scientific enquiry could be made and are now lost to archaeology. The academic literature is littered with such references. Modern-day detectorists seem to be a different breed, with different motives and a much more responsible attitude. The Staffordshire Hoard, dating to the 7th century – the largest ever Anglo-Saxon hoard of gold and silver, mostly consisting of war-gear, including some object-types that continue to puzzle archaeologists. The Frome (Somerset) Hoard – the largest ever Roman coin hoard found in a single vessel, consisting of 52,503 coins, deposited in in c.290. Two of the largest ever Viking Age hoards found were recorded through the PAS. Both hoards, of early 10th C date, highlight the extent of Viking expansion across England. Two of the largest ever Bronze Age hoards were recorded through the PAS. The Boughton Malherbe (Kent) Hoard (352 objects found in 2011). Such hoards were once thought to be metalworking scrap, but archaeologists now believe they were deposited ritually, perhaps as offerings to lost gods. Could Ireland benefit from a similar scheme ??? Critics of such a move point out that PAS costs over £1,000,000 sterling to run per year ! But, are we (in Ireland) missing out on valuable finds and information? By closing the gate on the genuine detectorists, are we leaving the field to the thieves and looters? Is Irish archaeology losing important (unknown) sites to the criminals, while they smuggle their ill-gotten gains out of the country? If we had a similar system to PAS, would Irish archaeology benefit? I also believe we should have a new system to ‘categorise’ finds + fund their preservation and/or further research into the artefacts and/or the find site. There is a huge interest in local history throughout Ireland and many libraries have a local history section with online databases, shared photographic archives and a thriving local scene in local history socieities, local photography clubs and other ‘local’ initiatives. I believe a local detectorist club would sit nicely alongside these other ‘local’ interest groups. This is what has happened in England & Wales since the inception of the Portable Antiquities Scheme. Reblogged this on The Old Currency Exchange is a specialist dealer and valuer of coins, tokens and banknotes.